Hi all! Tuesday night's presentation at the South Portland Dog Owners Group meeting went well. I love the challenge of boiling the concepts of Natural Dog Training down to an even more refined message - and it was also great to be able to field some questions from the members in attendance. Since most questions asked dealt with the subject of dog aggression (a topic near and dear to hearts) it was a perfect opportunity to talk about these core concepts: prey/predator instinct in dogs, the way that our dogs feel the world, and the importance of teaching dogs how to relax in high energy moments. Thanks to Crystal Goodrich (sopodog.com president) for having me, and welcome to those of you who were at the meeting and are stopping by to check things out! 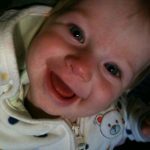 Today is my wife's birthday (check out her blog, happydash.com, here), and I'm working on my article for the Blog Carnival (coming tomorrow), so I'm going to leave you all with this tip. I'm frequently asked how much time each day should be devoted to dog training. As always, it's the quality that counts, not the quantity. 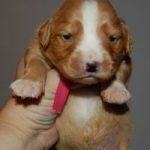 Whenever you interact with your dog it is an opportunity to train your dog - since, as you've been reading here, it is changing the way that you interact with your dog that will have some of the most significant effects on your dog's behavior. The more that you learn to be calm and assertive like the moose (instead of the alpha dog) - and reinforce it through direct training or through play - the more your relationship with your dog will grow, and the more your dog's naturally "obedient" state will come through. Remember that dog obedience behaviors are actually, at their core, hunting behaviors - so the more that you elicit their hunting nature, the more you are allowing them to do what they naturally do - and the more you are encouraging social behavior. If you are working on the technique of pushing (one of the foundations of Natural Dog Training), then meal-time with your dog becomes the most appropriate time to train. Instead of just putting your dog's food in a bowl and walking away, why not turn those times into productive, positive interactions between the two of you (as well as capitalizing on the energy their hunger will bring to your work together)? It also gives you two set times each day to train - which will help you stay consistent with your training (and alleviate the guilty feelings you may have about not spending "enough" time with your dog). Also, stay tuned for a new design for this site. 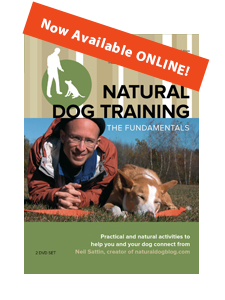 I'm going to make sure that everything here is much more easily accessible, as well as give you a section on the "basics of natural dog training" - so that you'll be able to follow along in one-stop-shopping fashion. If there's anything you'd like to see featured in a new website, please let me know!